Perfect for scratchy throats, stuffy noses, and chest congestion, this tea has a spicy kick that you’ll feel. 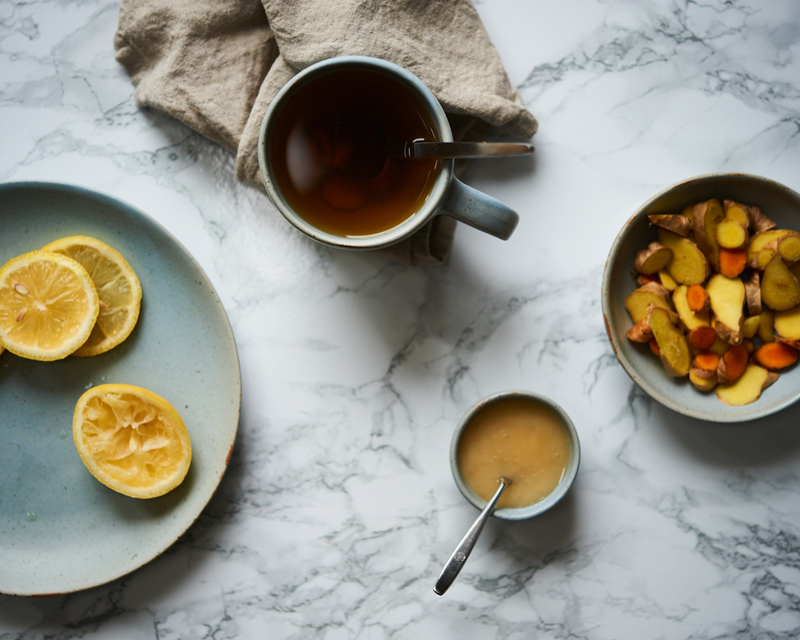 This is our spin on the classic ginger lemon tea that we always make when anyone is sick, with the addition of fresh turmeric root. If you can’t find fresh turmeric, then you can add in some ground turmeric instead. Ginger supports your immune system, lemon provides a great dose of vitamin C, and turmeric helps reduce inflammation (ginger helps with inflammation too). The finishing touch on this tea is a spoonful of raw honey, which is also soothing for a sore throat. If you can’t eat honey, then you can substitute in some stevia instead. 1. Slice the ginger root and turmeric root in thin pieces. If they are organic, you can leave the skin on, just rinse it off well. 2. Place the sliced ginger and turmeric in a pot with 4 cups of water. Bring to a boil and then reduce to a simmer. Cover and simmer for 5 minutes. You’ll notice that the turmeric will turn the water a rich golden tinted colour. If you don’t have fresh turmeric root, you can add in 1/2 tsp of ground turmeric. 3. Turn off the heat and add the lemon juice. 4. Pour into a mug and add raw honey to taste (we normally add a big teaspooon). Or, if you don’t heat honey, you can add stevia instead.